Thousands of people were entertained by a host of events and activities at the 11th Mouth of the Tyne Festival today. The opening day of events drew in the crowds, who were treated to music displays, pageants, workshops, street entertainers and more. 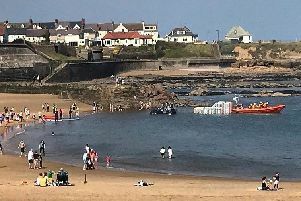 Activities were split between Front Street and Tynemouth Station, with a concert taking place this evening in Tynemouth Priory and Castle featuring The Specials and Roots Manuva. Pupils from Kings Priory School took part in a pageant and parade through the heart of the village. There were also jazz musicians on hand to perform plus a host of street entertainment. Children’s activities in Tynemouth Station included a photo booth, music, yoga acrobatics and more. The event continues tomorrow with more activities and entertainment lined up both in Front Street and Tynemouth Station. For a slideshow of pictures from the festival, see the Guardian website. And we’ll have more from the event online tomorrow.